Can you recollect the last time your mind was not present but somewhere else? Telltale signs are the blank, glazed look in the eyes. The eyes may be looking forward but gaze is beyond what’s right in front. The only thing present is the body. This is not unusual in our busy work-a-day world; no matter what the day and age, concerns elsewhere can draw us away from here now. The thoughts can be filled with excitement and expectation or of stress and concern and any other possibility. “Wow, those are rather large claims for a mindfulness-based program,” my skeptic side notes, before I’d even cracked the spine. Upon reading the first couple of paragraphs of the foreword, I was hooked in. Oddly enough in this book the hooking in of the mind, thoughts or images, the understanding of how the mind hooks in and what we can do about it, are the basic gems of inspiration in this book. We don’t necessarily fuse with all other things. The mind may simply note the thought and then file it away to be examined later. In this chapter called “The Great Storyteller” we are introduced to the power thoughts, we believe, have over us. Then without so much of a breath we are given the opportunity to examine our beliefs and practice ways to change them, if necessary. The basic criteria, in this book, for the reason to change is if the thought(s) are unkind and/or not useful. This is not a quick read, nor does the author encourage it. He constantly reminds us to put the book down and think about it and practice the very useful exercises. Dr. Harris reiterates that if an exercise confounds or just doesn't serve don't use it. 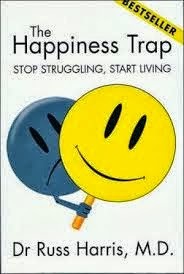 I am not hestitant to say that “The Happiness Trap” offers some very essential tools for life. I would even go so far as to say this book is the toolbox. Sorry, “other things” carried me away from this blog on other things. Unfortunately, when we fuse with “other things”, particularly when they’re scary or unpleasant, we inadvertantly deny ourselves a quality of life that inspires us to act in the moment, whatever arises in it. This is neither wrong nor is it definitive, it’s life practice, not life perfect. Or perhaps life perfectly unfolding in it's perfectly imperfect way. Whatever.